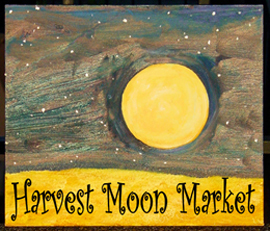 Registration for the 2013 Harvest Moon Market is now open! Don't wait, space is limited and on a first come first served basis. To register and pay via mail, click here to download a PDF Vendor Application. Have you already completed a 2013 Vendor Application? Click the button below to finalize and submit payment for your booth options. Home based companies such as Mary Kay, Thirty-One, Tupperware, etc. are limited to one space each. Set up is available beginning at 7:00am the day of the event. Please unload and park on the lower level on the west of the school building. Tear down is at 3:00pm. All vendors must stay open until then. Concessions will be available all day in the cafeteria beginning at 9:00am. White 6’ tables are available for rent. These are limited and available on a first come first served basis. All vendors are responsible for providing their own change. Spaces are non-refundable. Exceptions may be made at the organizer's discretion with 10 day prior notice, or in cases of emergency. Prior to the event an email confirmation will be sent to you informing you of your space number. If you didn't provide an email we will contact you regarding your space number. Registration by Credit Card or PayPal: Complete the online application and use the payment form to select booth options and complete your payment. Please attach a photo of your craft work along with your online application. If you are using a paper application, please email a digital PDF or jpeg file to sherinick@charter.net. or PayPal, please follow the instructions on the application receipt confirmation page to complete payment. I agree to participate in the Harvest Moon Market and do hereby and unequivocally agree to forever indemnify and hold harmless to the maximum extent permitted by law, Roscoe Parent Teacher Organization, Kinnikinnick Community Consolidated School District # 131, Roscoe Middle School, staff, administration, employees, parents, sponsors, and volunteers against loss, damage and liability for injury or death to persons, and loss or damage to property or theft that might occur to myself, my support staff, my merchandise or any booth space, arising out of, related to or otherwise in connection with my activities or presence at the Harvest Moon Market at Roscoe Middle School. I have carefully read this application and agreement, including this release, assumption of risk and indemnity paragraph, know the contents, and sign the application and agreement voluntarily. Please Note: If you have any questions or concerns, please contact Sheri Sinnaeve at (815) 505-0746 or sherinick@charter.net prior to registering.